Judge Kevin Dougherty & Judge Christine Donohue candidates for Supreme Court. 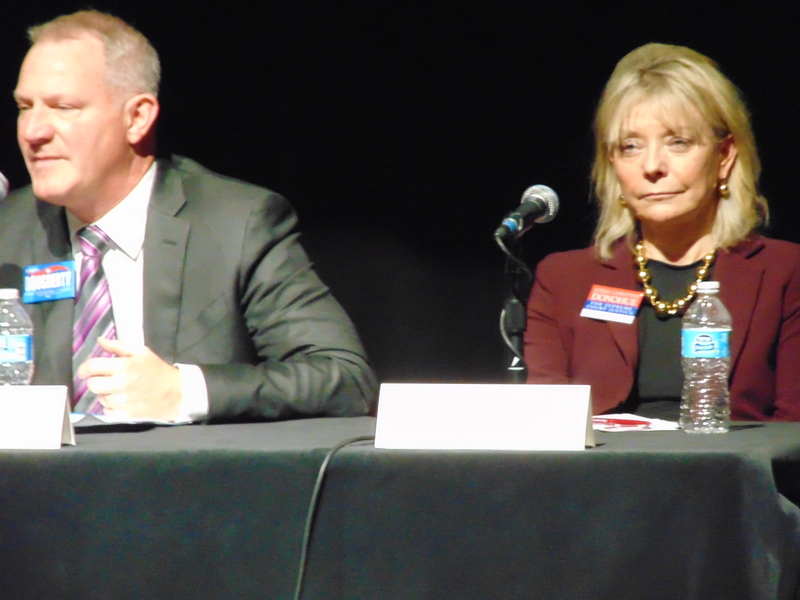 Philadelphia – Just two weeks ahead of a November 3rd election that includes the selection of three Pennsylvania Supreme Court Justices, a forum at Philadelphia Community College, Saturday, brought together five of the seven candidates. 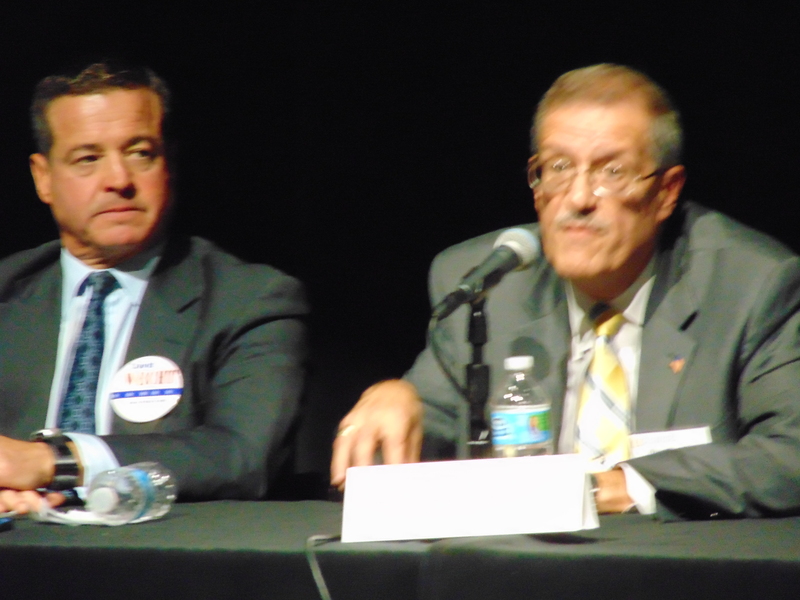 On issues ranging from the legality of Hazleton’s 2006 controversial immigrant proposal, Sanctuary cities, Voter ID bills to redistricting and English-Only initiatives, the forum touched on issues that are critical to Pennsylvania’s growing Latino community. Judge David Wecht, Judge Paul Panepinto. In introductory statements, Judge David Wecht – currently a Superior Court Judge – referred to a mother who fled Nazi Germany and would meet her husband in the U.S. Air Force. A Republican nominated to Allegheny’s Court of Common Pleas by Gov. Rendell, Judith Olson similarly spoke of grandparents who escaped “Bolsheviks” in Russia and Poland. A Pennsylvania Superior Court Judge highly recommended by the state bar, Judge Christine Donohue likewise cited her own gritty background of growing up in Carbon County, Pennsylvania, where her father was a coal miner and mother a seamstress in a dress factory. “At the end of the day, the people should choose the politicians, the politicians should not choose the people,” added Dougherty to applause. 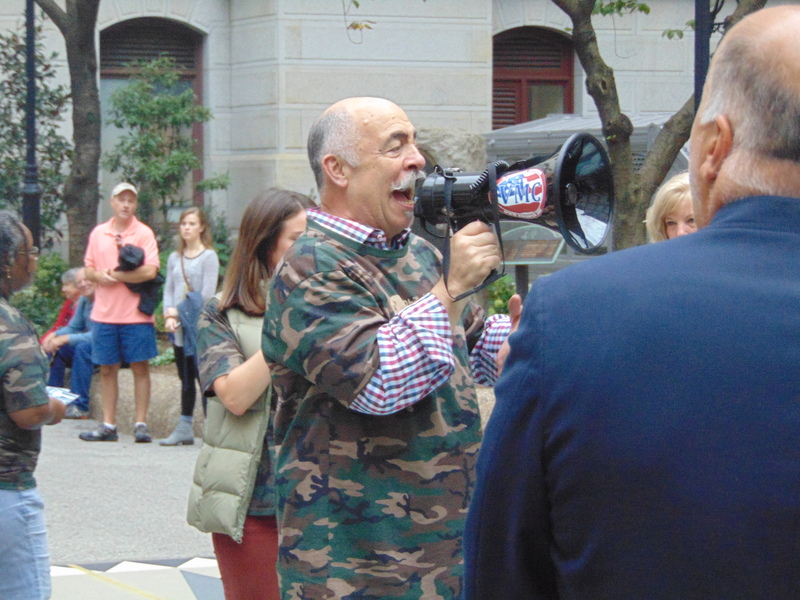 Denouncing the gerrymandered districts of the state as a “travesty” Judge Wecht attributed it to partisan Republicans. Judge Dougherty acknowledged there are elected officials who seek to impose burdens on the “ability to get into the voting booth,” for socio-economic reasons. 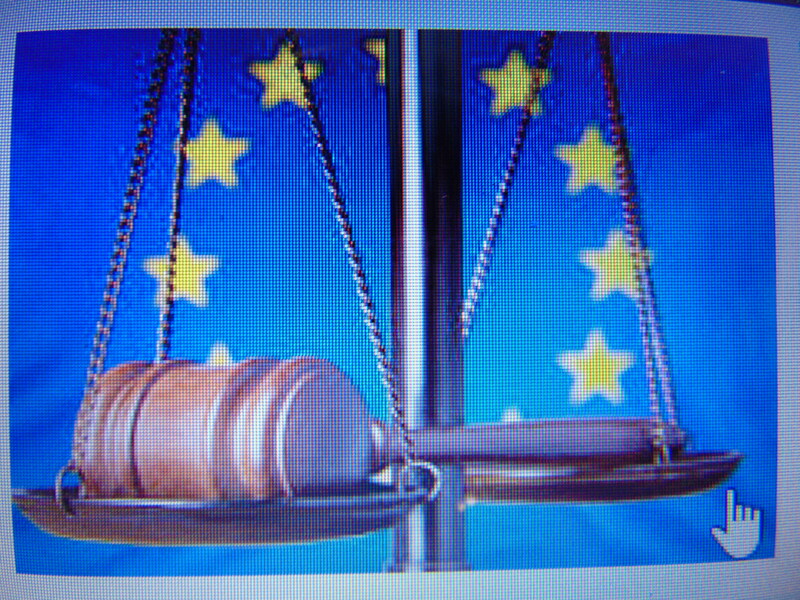 “The question is, are those avenues legal and will they stand” constitutional scrutiny. Historic Commission Marker for St. John Evangelist Church. 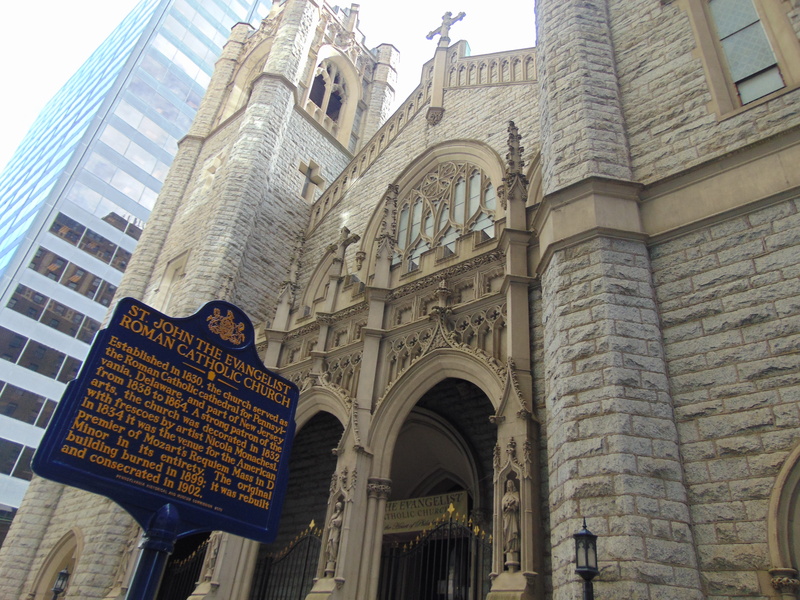 Philadelphia – The Pennsylvania Historical and Museum Commission honored St. John the Evangelist Church with a historical marker, Sunday, recognizing the church that has served Center City workers and families for 185 years. Councilman Mark Squilla, State Senator Larry Farnese, Lt. Governor Mike Stack and (retired) Judge Felice R. Stack -mother of the Lt. Governor- joined the Historical Commission’s Celeste Morello in paying tribute to a church tucked away between 13th and Market and Chestnut Sts., that served as the Catholic Cathedral of Pennsylvania, Camden County and Delaware from 1838 to 1864. The vaulted arches and ornate stained-glass and Monachesi frescoes are accented by St. John’s Music. Both Councilman Squilla and Lt. Gov. Mike Stack stressed the historical perspective of the church, noting that it had survived “anti-Catholic riots” of the 1840s which left 14 dead, more than fifty injured and caused up to $3.8 million in property damage. During the ensuing years it has continued to be a place of “compassion” that consistently “opened its doors” to immigrants, the poor and even those suffering through an influenza epidemic. Within its vaulting arches, ornate stained-glass windows St. John’s was accentuated by the frescoes of artist Nicola Monachesi in 1832. 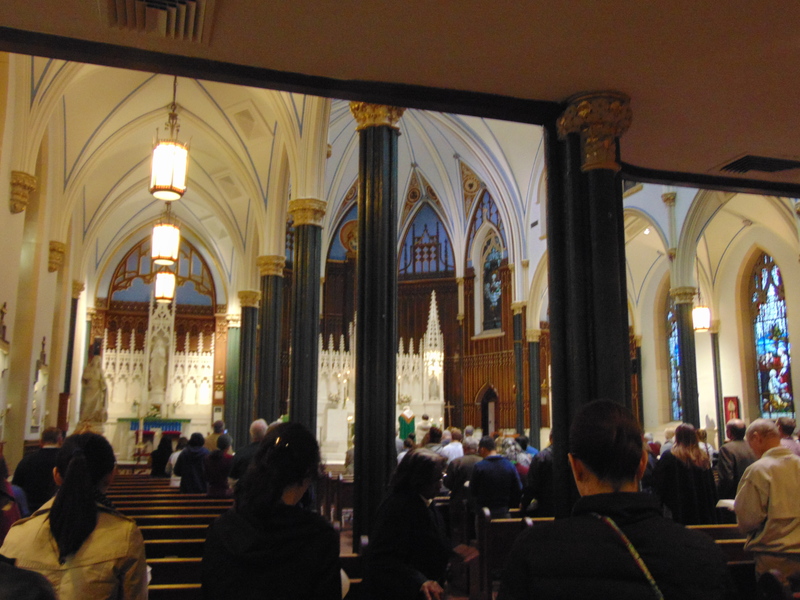 In 1834 the then-Cathedral served as the venue for the American premier of Mozart’s Requiem Mass in D Minor. Damaged by fire in 1899, the church was rebuilt in 1902. 32bj SEIU Pres. 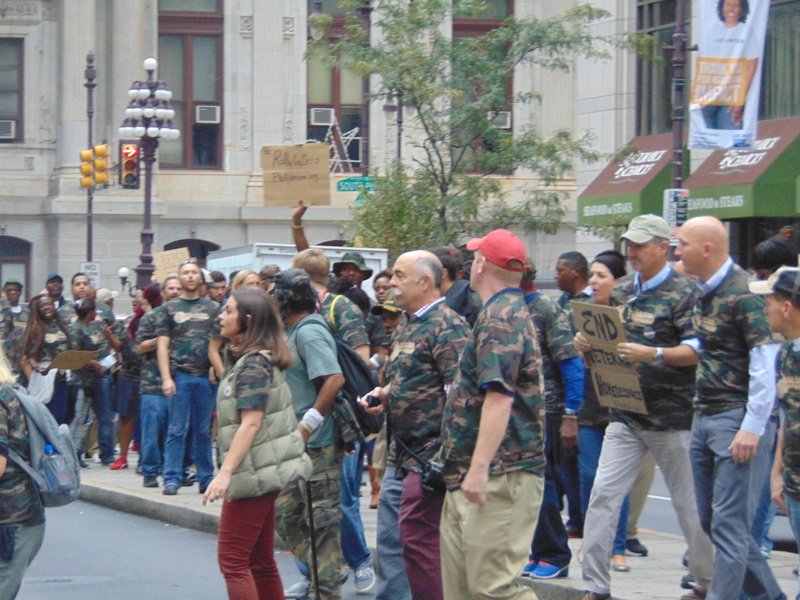 Hector Figueroa & D.Cruz lead march for fair treatment of Philadelphia Janitors. In a unified effort on behalf of maintenance workers recently fired by new building management at 21st and Chestnut street, nearly 3,000 janitors and supporters of SEIU 32BJ from Boston, New York and Baltimore to Pittsburgh and Washington D.C., marched to LOVE Park, Thursday, demanding reinstatement of the displaced workers and for recognition of union representation they say is essential to fair wages and benefits. With union construction workers along Market Street halting work in a symbolic gesture of solidarity, the purple clad SEIU workers were also joined in their march by a host of city officials, including Democratic Mayoral candidate Jim Kenney, Council President Darrell Clarke, Councilwoman Maria Quinones Sanchez, Councilmen Mark Squilla, Curtis Jones, Bill Greenlee, Kenyatta Johnson, W. Goode, Bob Henon and Dennis O’Brien. 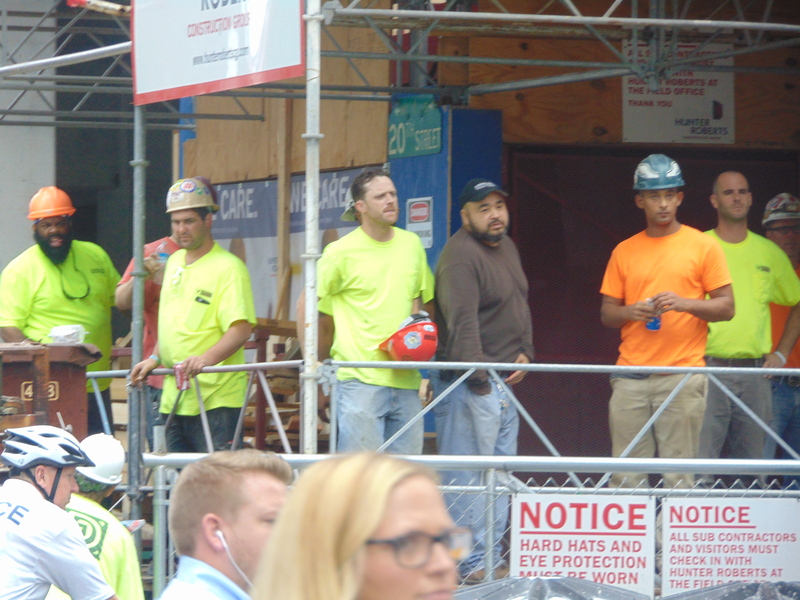 Union Construction workers paused in a gesture of solidarity with SEIU Janitors. “I’d like to see our wages go up every year. I think we’re entitled to that,” she said, adding that 32BJ SEIU is bargaining to maintain the current level of medical and pension benefits. 32bjSEIU Pres. 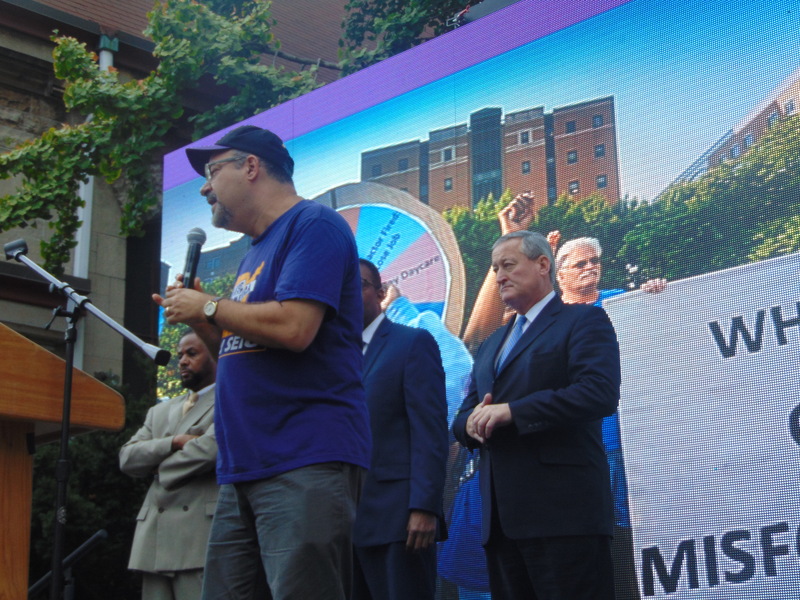 Figueroa urged nonunion janitors to “join” the unionized force, supported by Mayor candidate J. Kenney and Council Pres. Darrell Clarke. 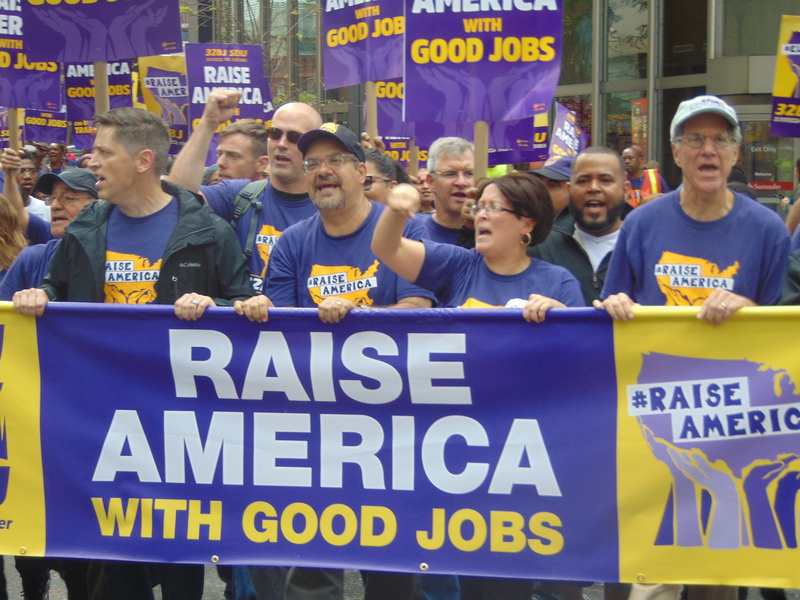 The leadership of 32BJ SEIU janitors gathered in force to bolster negotiating efforts for fair wages and benefits on behalf of Philadelphia’s Janitors. The SEIU is negotiating a new contract with Building Operators Labor Relations Division Building Owners & Managers Assoc. 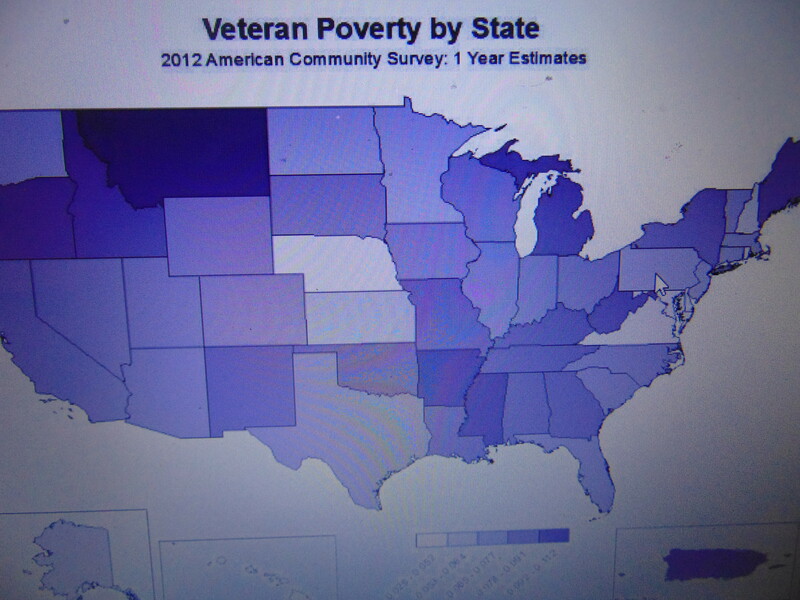 of Philadelphia, as the earlier contract expires on October 15th. “Everything I’ve become has to do with the labor movement and my parents having access to good wages and good benefits,” Kenney said. 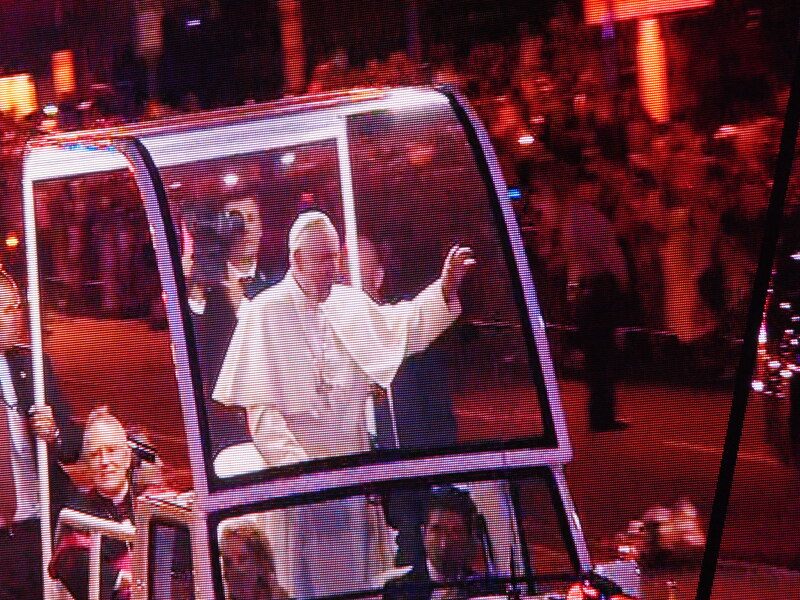 Pope Francis received overwhelming cheers from hundreds of thousands in Philadelphia who waited several hours. 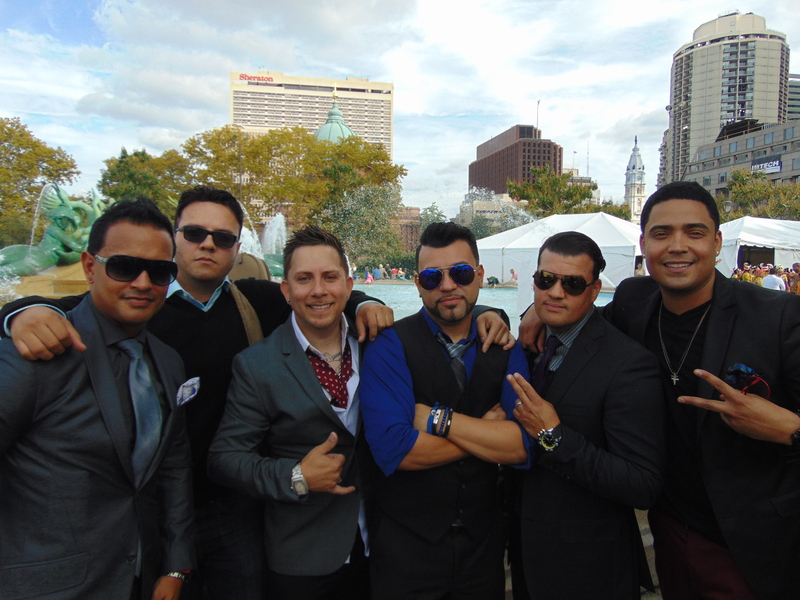 Philadelphia’s ‘Viva Mas” got the crowd dancing and were “honored” to be part of WMF. Deputy Clerk for Camden County, Angel Fuentes – a former altar boy who often speaks of the deep faith of his Puerto Rican-born mother – had signs made offering ‘Bienvenido Pope Francis.” Fuentes carried this message of ‘welcome’ as he and his family arrived in the city by walking across a closed Ben Franklin Bridge. 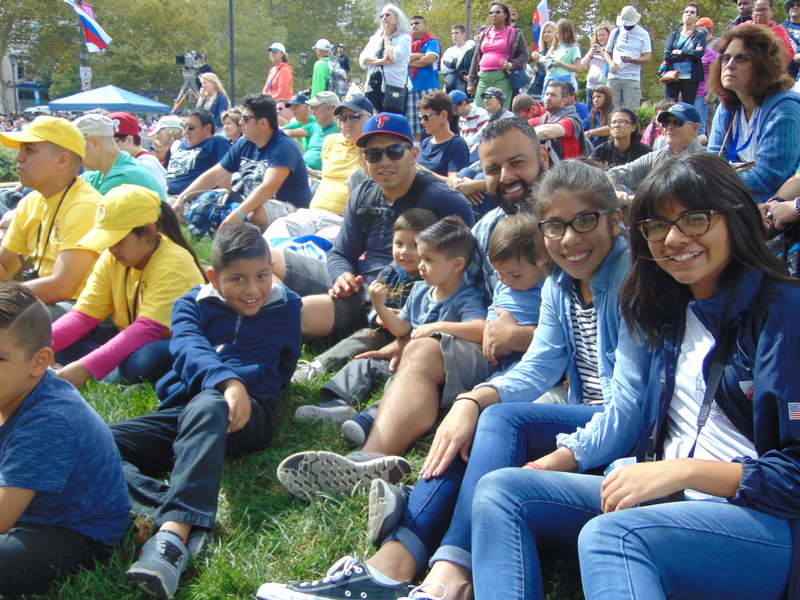 Gonzalez family from California, Josue wanting his children to be inspired by Pope Francis. “Just being here in Philadelphia is a miracle itself,” he added, as he and his four sons watched several performances of Saturday’s daylong WMF Franklin Parkway festival. Sisters on the Parkway. 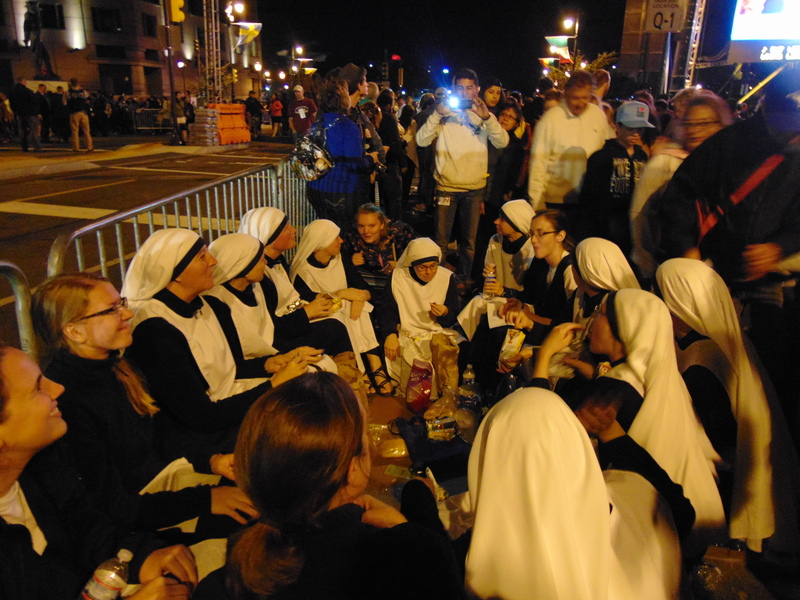 From all over the world Nuns participated in WMF event in Philadelphia. Among the early Family Festival performances included a medley of diverse music and dance: including St. Raymond’s Choir -a predominantly African American parish, Indonesian and Philippine dance companies, Nigerian Catholic choir, a Syro Malabar Indian Catholic Church -with ties to Syria- and Philadelphia’s Viva Mas. After performing three up-tempo numbers that prompted some in the Parkway audience to dancing, Viva Mas left to to boisterous applause. “It’s surreal,” enthused Raul Figueroa. “You feel just blessed and overwhelmed to be here with all these different cultures coming together.” The other members of Viva Mas: Eddie, Eli, Raul, Mike and Eric, laughed in agreement.